A recent study by Facebook IQ, in which people completed one-on-one conversations in VR, concluded that most people respond positively, and introverts in particular feel more comfortable. Facebook IQ is a team established to assist marketers in understanding the way people communicate online and offline. Facebook has been exploring the potential of social VR since their famous acquisition of Oculus VR in 2014. More recently, they detailed the results of their social VR avatar experiments and are planning to launch a ‘social VR app’ very soon. A different social experiment was recently completed by Facebook IQ, an internal team who help businesses understand communication trends and advertising effectiveness – asking 60 people to have a one-on-one conversation, half of them being in person, and half being in a VR environment wearing the Oculus Rift. 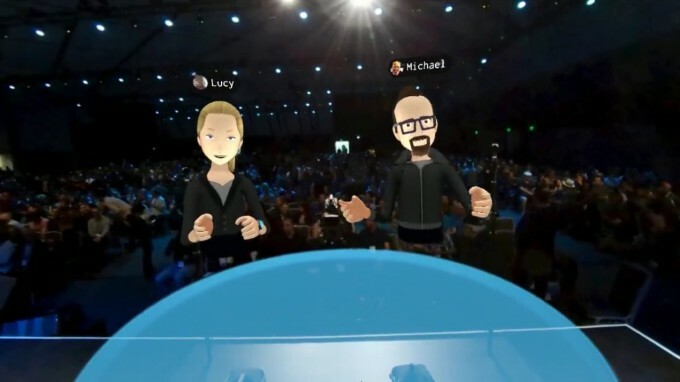 Interestingly, they didn’t use the VR avatars seen in Facebook’s own demonstrations, nor did they use the Oculus avatars found in the Rift’s menus – instead they used vTime, a popular ‘sociable network’ app available for Rift, Gear VR, Cardboard and Daydream. vTime uses its own full-body avatar system, complete with automatically-animating hands – surprising that these would be used in such an experiment. However, it seems like the main reason for choosing the software was to use its comfortable ‘train cabin’ environment – a familiar and natural place to converse with a stranger – and the focus of the experiment was about vocal communication. Applied neuroscience company Neurons Inc was commissioned to assist with the study of cognitive and emotional responses; all participants wore high resolution electroencephalography (EEG) scanners, used to record electrical activity in the brain, and eye trackers. With half the group conducting a normal one-to-one conversation in person, and the other half engaged in vTime, Neurons Inc was able to compare the level of comfort and engagement of a VR conversation compared to a conventional one. The eye trackers helped to determine the user’s level of attention, and the EEG scanners were used to assess motivation and cognitive load, based on the level of brain activity. If the load is too low, it means the person is bored; too high and they’re stressed. According to the report published on Facebook Insights, the participants, who had mostly never tried VR before, were within the ‘optimal range of cognitive effort’, being neither bored nor overstimulated. The cognitive load decreased over time, meaning that people naturally became more comfortable as the conversation progressed. In the interviews that followed, 93% said that they liked their virtual conversation partner, and those who were identified as more introverted responded ‘particularly positively’, being more engaged by meeting in VR than by meeting in person. Many new parents still think that babies should develop at their own pace, and that they shouldn't be challenged to do things that they're not yet ready for. Infants should learn to roll around under their own power, without any "helpful" nudges, and they shouldn't support their weight before they can stand or walk on their own. They mustn't be potty trained before they are ready for it. According to neuroscientist Audrey van der Meer, a professor at the Norwegian University of Science and Technology (NTNU) this mindset can be traced back to the early 1900s, when professionals were convinced that our genes determine who we are, and that child development occurred independently of the stimulation that a baby is exposed to. They believed it was harmful to hasten development, because development would and should happen naturally. Early stimulation in the form of baby gym activities and early potty training play a central role in Asia and Africa. The old development theory also contrasts with modern brain research that shows that early stimulation contributes to brain development gains even in the wee ones among us. Van der Meer is a professor of neuropsychology and has used advanced EEG technology for many years to study the brain activity of hundreds of babies. The results show that the neurons in the brains of young children quickly increase in both number and specialization as the baby learns new skills and becomes more mobile. Neurons in very young children form up to a thousand new connections per second. Van der Meer's research also shows that the development of our brain, sensory perception and motor skills happen in sync. She believes that even the smallest babies must be challenged and stimulated at their level from birth onward. They need to engage their entire body and senses by exploring their world and different materials, both indoors and out and in all types of weather. She emphasizes that the experiences must be self-produced; it is not enough for children merely to be carried or pushed in a stroller. "Many people believe that children up to three years old only need cuddles and nappy changes, but studies show that rats raised in cages have less dendritic branching in the brain than rats raised in an environment with climbing and hiding places and tunnels. Research also shows that children born into cultures where early stimulation is considered important, develop earlier than Western children do," van der Meer says. She adds that the brains of young children are very malleable, and can therefore adapt to what is happening around them. If the new synapses that are formed in the brain are not being used, they disappear as the child grows up and the brain loses some of its plasticity. Van der Meer mentions the fact that Chinese babies hear a difference between the R and L sounds when they are four months old, but not when they get older. Since Chinese children do not need to distinguish between these sounds to learn their mother tongue, the brain synapses that carry this knowledge disappear when they are not used. Babies actually manage to distinguish between the sounds of any language in the world when they are four months old, but by the time they are eight months old they have lost this ability, according to van der Meer. In the 1970s, it was believed that children could only learn one language properly. Foreign parents were advised not to speak their native language to their children, because it could impede the child's language development. Today we think completely differently, and there are examples of children who speak three, four or five languages fluently without suffering language confusion or delays. Brain research suggests that in these cases the native language area in the brain is activated when children speak the languages. If we study a foreign language after the age of seven, other areas of the brain are used when we speak the language, explains Van der Meer. She adds that it is important that children learn languages by interacting with real people. "Research shows that children don't learn language by watching someone talk on a screen, it has to be real people who expose them to the language," says van der Meer. Since a lot is happening in the brain during the first years of life, van der Meer says that it is easier to promote learning and prevent problems when children are very young. The term "early intervention" keeps popping up in discussions of kindergartens and schools, teaching and learning. Early intervention is about helping children as early as possible to ensure that as many children as possible succeed in their education and on into adulthood - precisely because the brain has the greatest ability to change under the influence of the ambient conditions early in life. "When I talk about early intervention, I'm not thinking of six-year-olds, but even younger children from newborns to age three. Today, 98 per cent of Norwegian children attend kindergarten, so the quality of the time that children spend there is especially important. I believe that kindergarten should be more than just a holding place -- it should be a learning arena - and by that I mean that play is learning," says van der Meer. She adds that a two-year old can easily learn to read or swim, as long as the child has access to letters or water. However, she does not want kindergarten to be a preschool, but rather a place where children can have varied experiences through play. "This applies to both healthy children and those with different challenges. When it comes to children with motor challenges or children with impaired vision and hearing, we have to really work to bring the world to them," says van der Meer. "One-year-olds can't be responsible for their own learning, so it's up to the adults to see to it. Today untrained temporary staff tend to be assigned to the infant and toddler rooms, because it's 'less dangerous' with the youngest ones since they only need cuddles and nappy changes. I believe that all children deserve teachers who understand how the brains of young children work. Today, Norway is the only one of 25 surveyed OECD countries where kindergarten teachers do not constitute 50 per cent of kindergarten staffing," she said. Lars Adde is a specialist in paediatric physical therapy at St. Olavs Hospital and a researcher at NTNU's Department of Laboratory Medicine, Children's and Women's Health. He works with young children who have special needs, in both his clinical practice and research. He believes it is important that all children are stimulated and get to explore the world, but this is especially important for children who have special challenges. He points out that a greater proportion of children that are now coming into the world in Norway have special needs. "This is due to the rapid development in medical technology, which enables us to save many more children -- like extremely premature babies and infants who get cancer. These children would have died 50 years ago, and today they survive -- but often with a number of subsequent difficulties," says Adde. Adde says that the new understanding of brain development that has been established since the 1970s has given these children far better treatment and care options. For example, the knowledge that some synapses in the brain are strengthened while others disappear has led to the understanding that we have to work at what we want to be good at - like walking. According to the old mindset, any general movement would provide good general motor function. Babies who are born very prematurely at St. Olavs Hospital receive follow-up by an interdisciplinary team at the hospital and a municipal physiotherapist in their early years. Kindergarten staff where the child attends receive training in exactly how this child should be stimulated and challenged at the appropriate level. The follow-up enables a child with developmental delays to catch up quickly, so that measures can be implemented early -- while the child's brain is still very plastic. A child may, for example, have a small brain injury that causes him to use his arms differently. Now we know that the brain connections that govern this arm become weaker when it is used less, which reinforces the reduced function. "Parents may then be asked to put a sock on the "good" hand when their child uses his hands to play. Then the child is stimulated and the brain is challenged to start using the other arm," says Adde. Adde stresses that it is not always advisable to speed up the development of children with special needs who initially struggle with their motor skills. A one-year old learning to walk first has to learn to find her balance. If the child is helped to standing position, she will eventually learn to stand - but before she has learned how to sit down again. If the child loses her balance, she'll fall like a stiff cane, which can be both scary and counterproductive. In that situation, "we might then ask the parents to instead help their child up to kneeling position while it holds onto something. Then the child will learn to stand up on its own. If the child falls, it will bend in the legs and tumble on its bum. Healthy children figure this out on their own, but children with special challenges don't necessarily do this," says Adde. Materials provided by The Norwegian University of Science and Technology (NTNU). Mind-controlled toys: The next generation of Christmas presents? The next generation of toys could be controlled by the power of the mind, thanks to research by the University of Warwick. Led by Professor Christopher James, Director of Warwick Engineering in Biomedicine at the School of Engineering, technology has been developed which allows electronic devices to be activated using electrical impulses from brain waves, by connecting our thoughts to computerised systems. Some of the most popular toys on children's lists to Santa - such as remote-controlled cars and helicopters, toy robots and Scalextric racing sets - could all be controlled via a headset, using 'the power of thought'. This could be based on levels of concentration - thinking of your favourite colour or stroking your dog, for example. Instead of a hand-held controller, a headset is used to create a brain-computer interface - a communication link between the human brain and the computerised device. Sensors in the headset measure the electrical impulses from brain at various different frequencies - each frequency can be somewhat controlled, under special circumstances. This activity is then processed by a computer, amplified and fed into the electrical circuit of the electronic toy. Professor James comments on the future potential for this technology: "Whilst brain-computer interfaces already exist - there are already a few gaming headsets on the market - their functionality has been quite limited. New research is making the headsets now read cleaner and stronger signals than ever before - this means stronger links to the toy, game or action thus making it a very immersive experience. "The exciting bit is what comes next - how long before we start unlocking the front door or answering the phone through brain-computer interfaces?" The emotion of awe is characterized by the perception of vastness and a need for accommodation, which can include a positive and/or negative valence. While a number of studies have successfully manipulated this emotion, the issue of how to elicit particularly intense awe experiences in laboratory settings remains. We suggest that virtual reality (VR) is a particularly effective mood induction tool for eliciting awe. VR provides three key assets for improving awe. First, VR provides users with immersive and ecological yet controlled environments that can elicit a sense of “presence,” the subjective experience of “being there” in a simulated reality. Further, VR can be used to generate complex, vast stimuli, which can target specific theoretical facets of awe. Finally, VR allows for convenient tracking of participants’ behavior and physiological responses, allowing for more integrated assessment of emotional experience. We discussed the potential and challenges of the proposed approach with an emphasis on VR’s capacity to raise the signal of reactions to emotions such as awe in laboratory settings. Science is a source of progress and the best hope for the future of mankind. With a world population reaching seven billion individuals and a growing consumption of (increasingly scarce) natural resources, the only chance that we have to avoid the collapse of civilization caused by our own expansion is to find new strategies for sustainable development. But addressing this challenge will be impossible without the support of scientific and technological innovation. Thanks to scientific research, we have conquered space, developed therapies for devastating pathologies, and explored the mysteries of matter. Science is illuminating our understanding of the most complex object in nature—the brain—and expanding our knowledge of the universe. But today, science is suffering from several diseases. In most countries, researchers strive to find the economic resources to carry out their research and keep their jobs. Since research funding is scarce, scientists are forced to compete with peers in order to obtain them. The odds of winning this hard competition, however, are increasingly more dependent upon the scientific impact and productivity of grant seekers than they are on the excellence of the research proposals. As a consequence, researchers who are not able to produce a decent number of publications on sufficiently prestigious outlets have almost no chance of receiving funding and realizing their ideas. This is why the notorious motto, publish or perish, has become the #1 concern of most researchers in the world. The pressure to publish has several negative implications. First, it pushes conflicts of interest and risks of scientific misconduct, for example falsification or fabrication of data. Furthermore, the spasmodic need to increase one’s h-index (a way to measure academic impact) leads researchers (and especially younger scholars) to focus on topics that are currently more mainstream or fashionable, and thus more likely to attract a greater number of citations from other authors. And last - but not least - while the rush to publish can generate more papers, it also increases the volume of poor scientific work. It could be argued that only a competitive system, such as the current one, can make it possible to select the best talents and ideas, thus ensuring the highest return on investment for society. But in reality, there is no evidence that the increase in scientific productivity is associated with better research outcomes. The Impact of Virtual Reality on Chronic Pain. Abstract. The treatment of chronic pain could benefit from additional non-opioid interventions. Virtual reality (VR) has been shown to be effective in decreasing pain for procedural or acute pain but to date there have been few studies on its use in chronic pain. The present study was an investigation of the impact of a virtual reality application for chronic pain. Thirty (30) participants with various chronic pain conditions were offered a five-minute session using a virtual reality application called Cool! Participants were asked about their pain using a 0-10 visual analog scale rating before the VR session, during the session and immediately after the session. They were also asked about immersion into the VR world and about possible side effects. Pain was reduced from pre-session to post-session by 33%. Pain was reduced from pre-session during the VR session by 60%. These changes were both statistically significant at the p < .001 level. Three participants (10%) reported no change between pre and post pain ratings. Ten participants (33%) reported complete pain relief while doing the virtual reality session. All participants (100%) reported a decrease in pain to some degree between pre-session pain and during-session pain. The virtual reality experience was found here to provide a significant amount of pain relief. A head mounted display (HMD) was used with all subjects and no discomfort was experienced. Only one participant noted any side effects. VR seems to have promise as a non-opioid treatment for chronic pain and further investigation is warranted. Abstract We sought to determine whether smart-tablet-based neurofeedback could improve executive function-including attention, working memory, and self-regulation-in children with attention problems. Forty children (10-12 years old) with attention problems, as determined by ratings on the Conners Parent Rating Scale, were assigned to either a neurofeedback group that received 16 sessions or a control group. A comprehensive test battery that assessed general intelligence, visual and auditory attention, attentional shifting, response inhibition and behavior rating scales were administered to both groups before neurofeedback training. Several neuropsychological tests were conducted at posttraining and follow-up assessment. Scores on several neuropsychological tests and parent behavior rating scales showed significant improvement in the training group but not in the controls. The improvements remained through the follow-up assessment. This study suggests that the smart-tablet-based neurofeedback training program might improve cognitive function in children with attention problems.